YOUR MAMAS NOTES: Thanks to not one, not two, but three snitches in Sydney, Your Mama has learned that the preggers but still pin thin actress Nicole Kidman is finally selling the Australian love nest she purchased in 1995 while married to that mystifying and minikin Tom Crooz dood. The porcelain skinned Miz Kidman has since moved on to bigger and better things than Tom Crooz including an Academy Award (The Hours)–something Mister Crooz has yet to achieve, upsettingly large new lips and another diminutive huzband, this time country music super star Keith Urban. Your Mama hasn't a clue how to look up Australian property records, so we can only relay what has already been reported about the Yarranabbé Road property that overlooks the soo-blime Sydney Harbor. 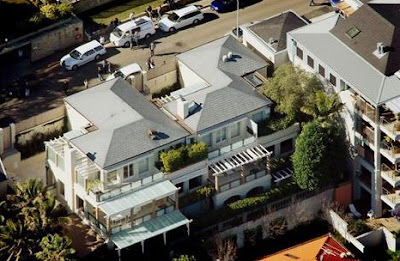 Miz Kidman's contemporary crib appears to be a three story affair with almost no yard or grass. The story goes that she and Mister Crooz purchased half of their former conjugal casa in 1995 for a reported $4,200,000 Australian dollars, which Your Mama's bejeweled abacus tell us converts to $4,013,302 at today's rates. In 1998, the then couple reportedly forked over another $4,750,000 ($4,583,853 US) for the other half of the duplex. There are apparently eight bedrooms between the two halves, which we Your Mama can only hope Miz Kidman had the good sense to hire a skilled architect and nice gay decorator to smoothly combine into one large superstar style residence. As of this morning we have been unable to locate a listing for the hillside property, but all reports from Down Under reveal the Darling Point duplex measures 1,068 square meters. Being mired in antiquated and xenophobic American measurement paradigms, Your Mama had to consult a mathematics expert to figure out that 1,068 square meters translates into a rather large (and approximate) 11,496 square feet. For a ladee who marries little men, she's a bit of a real estate size queen, ain't she? We first heard that Miz Kidman was looking to fetch around $18,000,000 AUS and later we read $20,000,000 AUS. Not that the U.S. dollar currently amounts much on the world monetary stage, but once again our bejeweled abacus informs us that converts to $17,199,864-$19,110,960 in the good ol' U-nited States. It's reported that Miz Kidman and Mister Urban are looking for a new Australian nest in the Eastern Suburbs so their soon to be born baby will have more outdoor space on which to run around and wreak toddler havoc. Miz Kidman an Mister Urban have been on a real estate whirlwind lately. It's been reported that she sold off a Walsh Bay penthouse in December of 2007 for $4,650,000 AUS. The couple also recently sold off their big and banal house on Bancroft Place in suburban Nashville for $2,360,000 and are reported to be building a new one on a 36 acre spread on Old Hillsboro Road in the nearby Franklin, TN area. And of course, there are always rumors running lickety split up and down Sunset Boulevard that the pale skinned red-head is looking for new Los Angeles digs so that she can be closer to the two children she (sorta kinda) shares with Tom Crooz. But as far as Your Mama and our spider web of contacts can suss out, she's not purchased anything...yet. Your Mama also read that the peripatetic Miz Kidman has also put a beach front property on the NSW far South Coast on the market for around $4,000,000 AUS. Interesting, thanks Mama. It appears Nicole has reached the point where she's ready to divest herself of everything and anything Crooz related and under the circumstances I see that as a healthy thing and positive step forward. Regarding your thoughts on hoping the two duplex halves were combinded, I don't know about that. It looks like there's a 5 level condo complex directly to the right of it in the photo, not the type of area I'd imagine most would be interested in plunking down $20MM for a single family residence with virtually no property to speak of. Mama.......just what do you mean by "little" men? Do you know something about Cruise and Urban that you are not sharing with the kids? More than a mouthful? Mama is a true ladee...She's referring to their height, not their length. It's about time she sold this place. She just couldn't seem to let go of the Cruise stuff. I'm worried about those two children that she "shares" with her crazy ex. Why do I get the feeling that they were the price she paid in order to divest herself of that maniac? Where are they, anyway? Does Tom keep them locked up in the mansion? The kids have been living at the Celebrity Scientology place - apparently they are quite "into it" though I can't imagine why, can you? Darling Point is primo Oz real estate - regardless of whether there are apartments next door or not, she should get this price easily going by recent sales in the area. Of course, some lawn never goes astray but I'll see if I can find some other Oz info on this property for you because the views are sublime. This is prime Sydney real estate & I don't think many properties in the area have actual land - I have a friend in Point Piper which is close to this property and they literally have a driveway & a balcony but an amazing view - As for the apartments next door, I doubt it makes any difference - They'll be worth millions also. Hopefully she'll use some of this money to actually buy a house in LA so she can attempt to be a mother to Bella & Connor. I can't get over a mother who has more money then God not having a home near her children. This house is gorgeous, I've long coveted it. And the view is to kill for. I love Sydney, this house is just divine. And I don't think Nicole has much say in how the Cruise kids get raised. I don't think she was ever in the equation. Hey Mama, the listing is on sothebysrealty.com. search australia, and it's under Darling Point, 6 Greenoaks Avenue. Glad to see the house is elevated.........given the dreadly Sydney funnel web spiders there. It is one of creation's nastiest spiders. I personally would prefer to spend the bucks, if I had them, on a period property in the English countryside I simply cannot see buying something crammed next to another property, no matter how lovely the view. Snowman, oh heck. Now I will never go on a survival retreat in the Australian outback. No really Sandpiper, the Sydney funnel web is a serious problem there. If you do go......shake your shoes out each morning........even your Manolos! I'm with you, Snowman, on all counts. Hopefully Nicole sells this easily and buys something decent in LA. Having no idea what her arrangement is regarding her two kids with Tom, I can only speculate and say that it seems as if she's been forced out of the loop and it seemed like a condition of the divorce. If so, that just seems sad. Seemingly. I think Cate Blanchett's house is also in the Darling Point area? Must be very prized property in Sydney. However, having a look at this property, I would pass on it. For the steep price it is not on the water. And secondly, it is facing double sky high apartment towers. Not to good for privacy, sun, or views. botox can make one's skin look kinda "porcelain", can it not? Still photos of patients after botox can be quite impressive with respect to wrinkles. With the face in animation, however, the look is often unnatural. As Joan Rivers has said...."can't you tell.....i'm sobbing! Skin peels may decrease skin pigmentation and make skin look "porcelain"
Maybe we're not searching the listings the right way,try "Ice Palace". She's moving to the Eatern 'burbs? Last time I was there, that area was hot, dusty and bug-infested. With all that cash, NK could find a house with land up or down the coast. It's true about those kids. Nicole had a spat at Crooz Control over Mothers Day, which she was not allowed to spend with them. Supposedly, they live with an aunt, not even with 'daddy'. Eatern? Yup, eatern up by bugs, roaches and deadly spiders. I was shocked to see on google earth that this is not an ocean front house .If this is 20 million what must the bigger houses facing the ocean with pools be priced at in this neighborhood? "She's moving to the Eatern 'burbs? Last time I was there, that area was hot, dusty and bug-infested"
The Eastern suburbs are one of the nicest & wealthiest parts of Sydney & Darling point where this property is located technically is the Eastern Suburbs. This area also contains the wealthiest streets in the entire country. As for spiders & bugs - you get them everywhere! Whether you're up high or down low you need to take care. Seems after a "tour" with the diminutive Crooz Dood, Ms Kidman should be well inured to bugs and spiders . . . Most people are saying she will buy closer to her parents, at Longueville, which (if she wants to be on the water) puts her 'up harbour' near Cate Blanchett who is in Hunters Hill. This is an old, established area with great waterside properties, good private (if very Catholic) schools, and a mix of lower income dwellings inland. On a side note, Sothebys does have two nice Hunters Hill properties listed. Eastern suburbs - lovely. Western surburbs - dry, flattish, boring burbs. Funnel webs? Get real. Sure, they live on that stretch of coastland but its been a while now between bites and there is a cure so no biggie. Besides, I think the eastern surburbs tenants now have gurls who, between scrubbing terlits, go out and beat the bushes and sweep the grass to get rid of them pesky spiders and snakes. Not to mention the feral 'roos (kangaroos) and koalas. Pool boys are known to be great distractors when you want to swim and you're worried bout sharks - just tie a pork chop to the pool boys leg - works a treat. And $10 to $30 million dollar properties are not as unusual as you think - harbour views and waterfront, especially if facing the harbour bridge and opera house, often considered much nicer than boring old coastline and beach. This people, is NOT Nicole's house. Shame on you YoYo. http://www.domain.com.au/Public/PropertyDetails.aspx?adid=2007129770# - I suspect the listing may not be published. Aussie in Exile in Canada. You might wish to check out the Australian Venom Research Unit website before dismissing these pesky little critters so glibly. I suspect a discreetly released crate of these little buddies near Nicole's home might lower the asking price considerably..........it just has to be done after the Terlit-Gurls have left for the day. you're right - wait for the girls to leave and unleash away - of course, the horde of paparazzi cars (as seen in the photo) might squash a few. sure funnel webs, red back spiders,etc. live on the coast but a shot of anti-venom and ya fine. we had a funnel web in the washing machine once but that was our holiday house about 3 hours south on the coast where they *really* like to live. lots of redbacks in our wood paling fence. my dad squashed them with his thumb. Alot of you people are either ignorant or idiots. Sydney is one of the nicest areas in the world and also one of the safest. There are no bugs such as funnel webs or snakes roaming the streets, just like there are none in L.A. You do not have to shake your shoes out in the morning...where did you hear this? Sydney is famed the world over for its beautiful views. It is one of the most desirable cities in the world, often compared to London, Paris and New York. The weather is amazing- not too hot in Summer, not too cold in winter. I have to say to all you Californians that Sydney is more like NY or London in architecture culture etc., and like these two cities, in the inner city areas( such as darling point )houses are often located close together. Just to give you an idea of prices and locations. The easter Suburbs(Kidman) and the Lower North Shore(Blanchett)are the two most desirable areas within Sydney. All of the suburbs located in these two areas(about 15 in all) have medium house prices well above 1 million. In the eastern Suburbs houses in the suburb of Point Piper are valued up to $80 mill for a waterfront property, however these never really hit the market). Currently there is a private listing in neighboring Vaucluse for $50 mill (all the papers have been talking about it even though it is not been listed to the public). On Saturday a house hit the market for $40 mill in Watson's Bay, another suburb located in eastern Sydney. House sales for waterfronts throughout this area of Sydney are always above $15million. Any house in this areas starts at $1.5mill and a house with a view starts at around $4million. In the lower North Shore, house sales are equally expensive. Mid last year a $50 million dollar offer was knocked back by the owners of a Balmoral Waterfront. Waterfronts throughout this area start at $12mill for a knockdown. In parts of the lower North Shore(Balmoral, Mosman,Cremorne, Cremorne Point) any type of house will start at 1.5 million, but most are valued much higher. Houses on the hill sides overlooking the harbor or beach start at $4mill, and often are valued at $10mill. Hunters Hill where Cate Blanchett lives is another prestigious lower north shore suburb. Waterfronts here today start at $10 mill. Cate bought back in 2004 on the water for 10.2 for a house requiring major work. In Sydney there is a great shortage of supply of luxury houses, meaning more and more areas are becoming wealthy (similar to NY). Even the inner west of Sydney is now becoming expensive with waterfronts there now costing $8 mill+ in places such as Birchgrove. All of the areas mentioned above are wealthy, established, have excellent culture(galleries, shopping, restaurants etc. ), and amazing water views. Sorry all for such a long comment but I thought you all needed to know the truth about Sydney, and its real estate. P.S mama: love the blog. Just in case you haven't guessed...yes I do live in Sydney. Darling point has too many aprtment blocks on it. Beter off spending $20m 5 minutes drive away at point piper. And I'd say the architecture/culture of Sydney is more in line with San Fransisco with a hint of L.A.
Neurophilly; my experience with Australians is that if they were any nicer.....they'd cause cavities. We have hosted families for, you guessed it, ice hockey camps with my kisa and I have never met any nicer. I did, sneak in while they were out and shook out their shoes and clothes. glad to hear you call it ice hockey - i get looked at a mite strange like here in canada - what other sort of hockey can there be, eh? seriously, never a bad idea to shake out the shoes. my fave "Oz against the world" joke is the flight attendants spraying you with disinfectant when you arrive at the airport - always gave me a good laugh - never did figure out what they were trying to kill, apart from passenger good will. other Aussies on here - lower north shore? please. too many large mortgages; where its not US execs at their Asia/Pac branches, its overextended people with double mortgages and major attitude. The area is physically beautiful but ugh, the people can be vile. I lived at Kirribilli on the water (in a very old apartment building) and it was groovy, as is Lavender Bay, but places like Mosman? Too many SUV's and blonde wives, thanks. don't forget Palmy and Avalon; seems just about everywhere called Palm Beach has expensive real estate. For non-Aussies, this is the far north peninsula of the northern beaches area of Sydney - where billionaires often have holiday homes or family compounds. tres nice and *relatively* unspoiled. p.s. Glad they were sweet, stpaulsnowman, as an ex-pat I can say most are but like everywhere, ya gets ya ratbags too! Yes, Palm Beach, Whale Beach, etc and the northern beaches are a gorgeous part of Sydney - with many, many stunning properties. I've always loved that area - stunning coastline/cliffs and beaches, not to mention the Pacific Ocean. Drool! I only know Aussies like Hugh Jackman and The Wiggles. Where do they live in relation to Kidman?